I have known the title for this post for a long time. In my heart I knew it was true, but I struggled to articulate why. Now I can. I read David Murrow’s book Why Men Hate Going to Church hoping to understand why I struggle so with church attendance. Though it’s no one’s fault (and yet we are all complicit), the Christian church is a place where women thrive and men die. In most all that it does—from décor, to language, to programs, to music, to sermons—today’s church provides what women crave, while offering little that appeals to men. 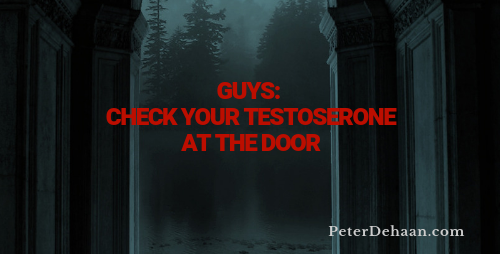 Guys: check your testosterone at the door. I am an advocate who pushes the envelope for change, yet the church is adverse to change. There is no place for my voice. I am a thought leader who pursues innovation, yet the church wants lay leaders it can control. It doesn’t want me. I am a person who challenges the status quo, yet the church institution exists to maintain the status quo and suppress dissension. It fears what I represent. I am a spiritual seeker who probes issues that most don’t consider, yet the church hates questions that lack pat answers. It shuns me because I am spiritually impertinent. I am a follower of Jesus who yearns to take spiritual risks, yet the church wants to be a safe place that doesn’t confront anyone’s unexamined theology. My risk-taking perspective isn’t wanted. Incidentally, David Murrow says the one instance where men find a place is in church plants. I get that. I was alive at this new church. Yet over time, decision by decision, the church became civilized. It instituted structure and limited me. It became more and more like the thing it sought to break free from. I no longer fit. I slowly withered. I didn’t want to go to church there anymore. But in the end, I don’t so much like this person I’ve become, and the church still doesn’t want me. After all, church is geared for girls and I’m a guy. Is it a matter of being in charge? This jockeying for position seems to be a part of men’s DNA. Only a small portion of men can be in charge. Only a small percentage can do the preaching/teaching. Our church is very male oriented when it comes to leadership. Women only teach other women or children. Outreach to children is a big part of our outreach. Cindy, thanks for your comment. I don’t think it’s about wanting to being in charge but guys like to do things more so than discuss things.